Field artillerymen of Battery A, 2-218th Field Artillery, 41st Infantry Brigade Combat Team, Oregon Army National Guard, fire a 105mm shell from a Howitzer at Yakima Training Grounds, Wash., during the units annual training Aug. 9. Today, I want to write about Grog. Grog and citizen-soldiers, actually. One is the fuel, the other is the shield and sword of this great nation of ours, and our tradition of both goes back hundreds of years. 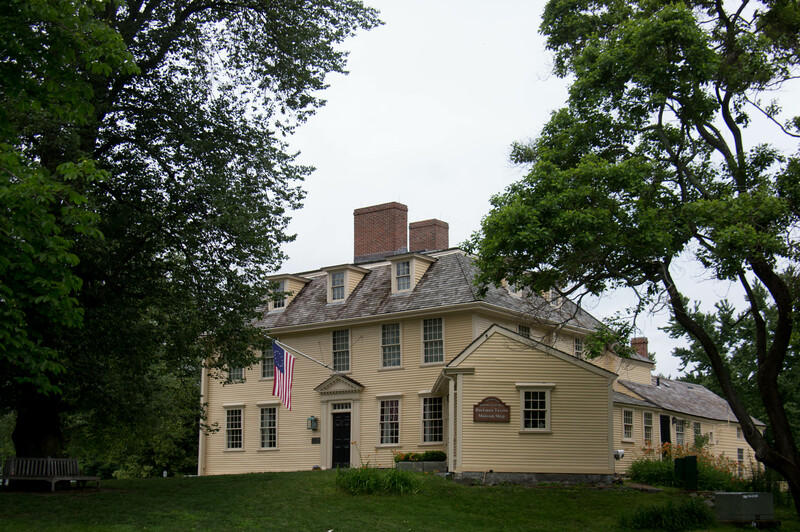 What were the Colonial militiamen doing at Lexington when the Redcoats marched into town? Drinking breakfast at Buckman’s Tavern, of course! 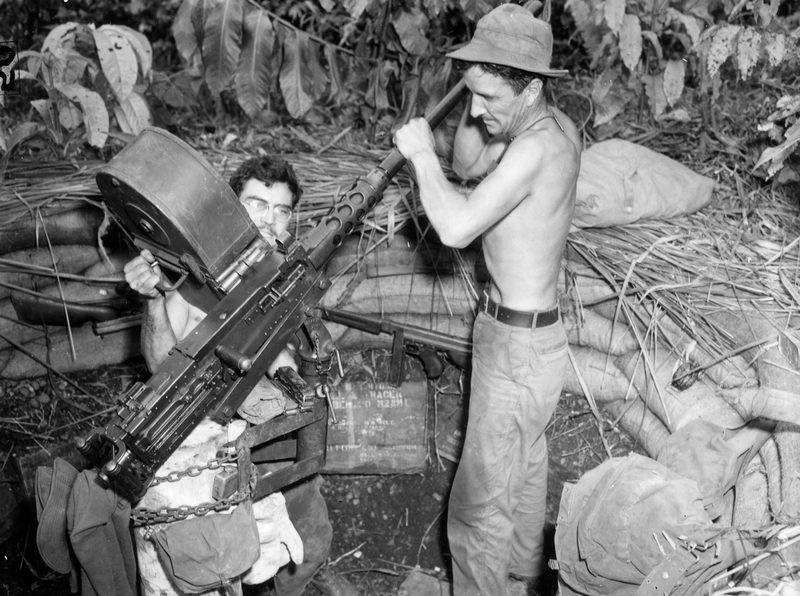 Grog is a time-honored Army tradition. I’ve been to numerous dining outs over the years, and have always had a lot of fun with the grog bowls in each. You get to know a unit by what they put in their grog, and what they put it in. The first grog I ever sampled belonged to Bravo Company, 2-162 Infantry. I can’t remember everything that was in that grog–hell that whole night is pretty fuzzy after I started drinking it–but I do recall sand from Iraq, filthy socks and too many different types of hard hooch to count being dumped into the bowl by the unit’s senior NCO’s. It was drunk not from fine china cups or crystal glasses, but a mangled, well-worn infantry boot. Somewhere, there are photos of me drinking from the boot that should never, ever be published. God it was nasty stuff–like burn your nostrils and set fire to your face nasty. 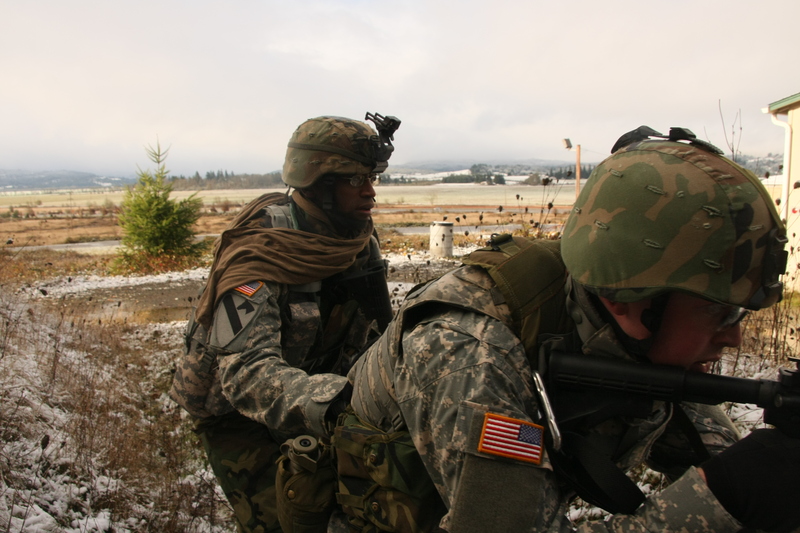 From 2005-2013, I spent a lot of time with the National Guard units in Oregon, writing about them and serving as the leader of a volunteer group of civilians who filled the OPFOR role. This gave me access to free grog! The 82nd Engineers had their own twist on the grog bowl. Again, the details are fuzzy, but as I remember they used the bucket from a backhoe as the grog bowl. An ancient engineer boot was the drinking utensil of choice. Lots of gritty stuff in that one as well. I was lucky to be invited to a couple of dining outs with Alpha Company, 2-162, where I made the life-threatening crucial error of trying to keep up with the Legendary Alan Ezelle as he and Brian Hambright raided the open bar. By the time the grog had been poured and stirred, I was already barely able to walk. All I remember from that night was taking a drink from the boot and feeling my ears blow off. I vaguely recall projectile vomiting in Ankeny Hill Wildlife Refuge some hours later. I tasted whiskey and coffee grounds in my mouth for days, despite gargling with Listerine (and when that didn’t work) rubbing alcohol. Just to be clear, I’m not a heavy drinker. On an empty stomach, I am a complete lightweight. National Guard Grog devastates me every time. Earlier this month, I was honored to be the guest speaker at the 2-218th Field Artillery’s dining out. I was both excited to see what artillerists put in the grog, and also very nervous about making a spectacle of myself after drinking it. The affair was hosted at the Embassy Suites in Portland, and for a change I had appropriate attire. Until about a year ago, I had not owned a suit since 1996 and was always severally under dressed at these functions (and funerals). This made me even more nervous though, as I began to wonder how one cleans grog barf out of super 120 wool. Artillery grog is composed of seven charges. Each charge has a particular piece of history attached to it. The first charge is a special blend that is mixed and buried for weeks by one of the members of the unit so that it may properly ferment and melt your stomach upon ingestion. Charges 2-7 all represent different aspects of the U.S. Army’s heritage or the unit’s history. Sake for fighting the Japanese during WWII. Cognac to honor our French Allies who helped give us the means to achieve our freedom. Scotch in honor of the British and our special alliance with them. The grog was mixed in what looked like an early 20th Century artillery caisson, then poured into shell casing mugs. Champagne, engine oil, a sock and some ladies stockings I believe were added to the mix to give it a bit of well, je ne sais quoi. The result was a pinkish concoction that upon first taste was light and (thanks to the engine oil) smooth. Unlike the other grog I’ve had, the Redlegs made something that was not only historically laden, but quite good. I was astonished. I looked at my new friends, cheered them and said, “See you in the ER gentlemen” as I took a swig. The champagne’s bubbliness lend itself to the charge 1 buried blend and the cognac, while the Scotch fueled a nice burn on the way down. Unfortunately, I was driving that night, so I could only have a taste. I didn’t wake up in prison nor in the ER wondering where my clothes were and how my chest hair got burned off, thus I consider the evening a win. 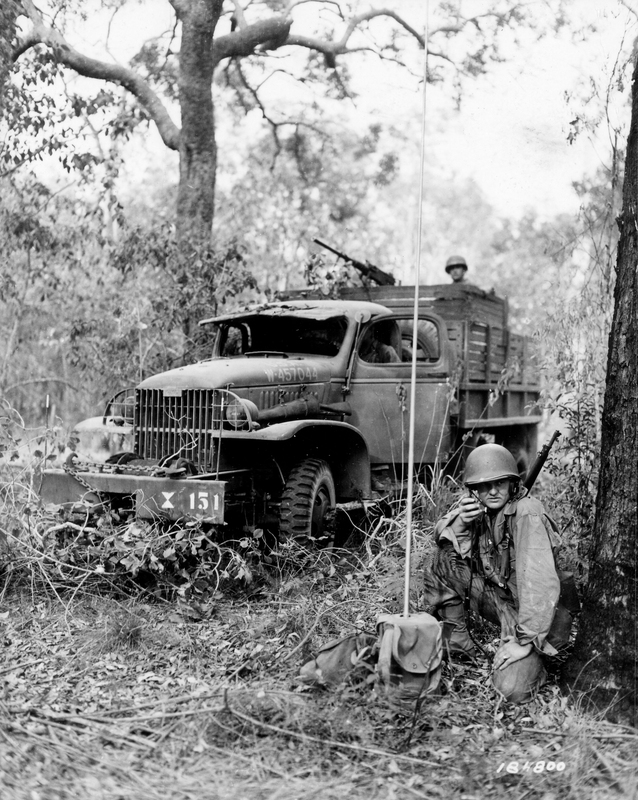 A 2-218th Forward Observer during a field exercise in Australia, November 26, 1942. In the summer of 1943, an Australian brigade and the 162 Infantry executed an amphibious landing at Nassau Bay on New Guinea’s northern coast. The plan was to push inland and take out the Japanese base at Salamaua. Doing so would eliminate the Japanese from eastern New Guinea and open up the way for MacArthur’s Island hoping drive to the Philippines. The landing was a disaster. Heavy surf swamped the only large landing craft available and most of the barges and LCVP’s were lost on the waterline as well. The 162nd struggled ashore without heavy equipment and without most of their radio gear to face a well-prepared enemy fighting from interlocking pillboxes and log bunkers. They called it the Shipwreck Landing. The 218th Field Artillery was supposed to have gone ashore with the 162, but the destruction of so many landing craft made that impossible. Instead, B and C Batteries, landed a few days later. They began taking casualties on that first day. Japanese snipers lurked in the jungle around them. Hold outs laid on point-blank ambushes. Booby traps claimed several men. The weather went from steamy hot to sudden deluges that left the men shivering. 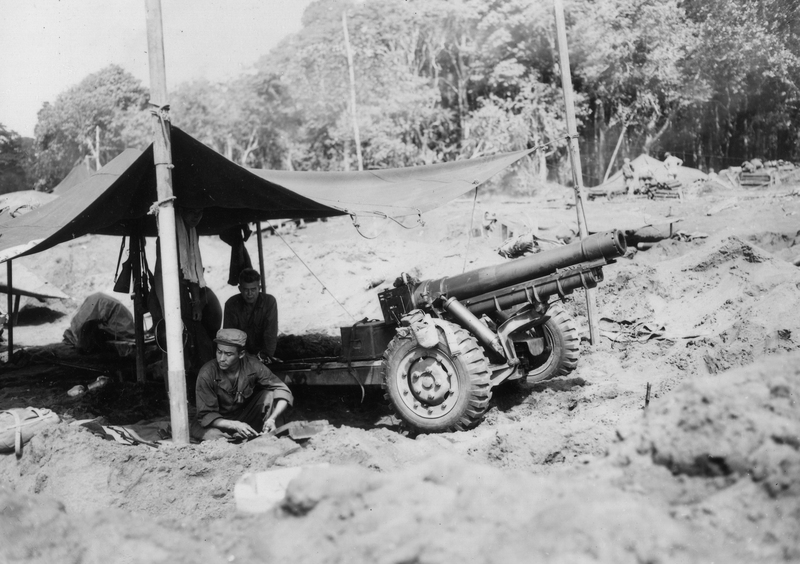 The 80 men of C Battery and their four 75mm pack howitzers were of no use on the beach. The infantry had slogged inland already, and the Oregon artillerists were tasked with hauling their guns five miles through swamps, across creeks and rivers—by hand. They broke the weapons down, made makeshift litters from tree limbs to carry some of the gear and waded through chest-deep swamps teeming with crocodiles. Several men in other units had been eaten alive by those animals. Others had been swept away in the fierce current of the Bitoi River. 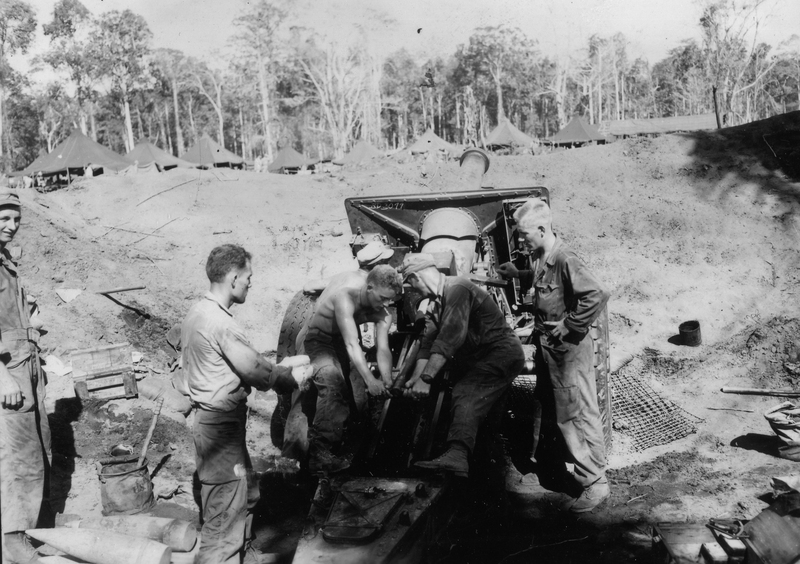 The men of C Battery crossed and recrossed that river at least six times as it wound around the only jungle track that could take them to the Japanese. 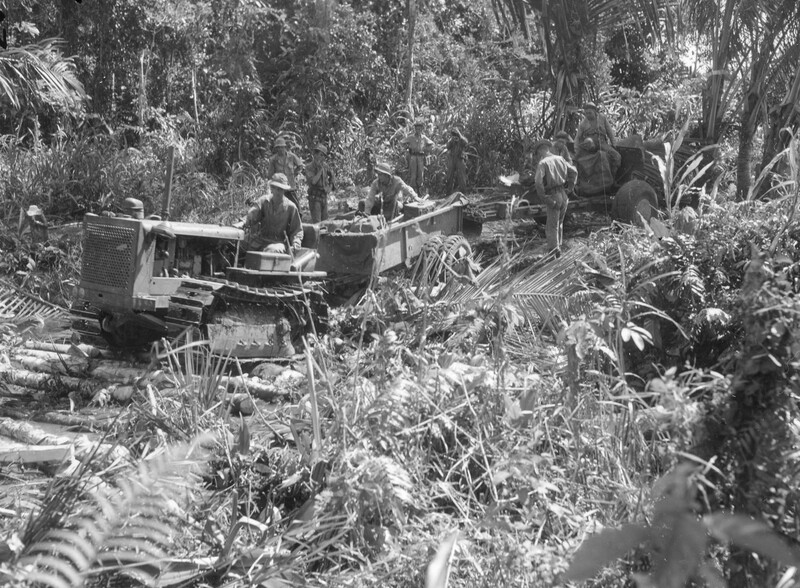 When they cleared the river, they had to carry their howitzers up steep slopes and down the backsides of ridges into leech and mosquito-filled swamps. With their four guns, they brought four hundred rounds of 75mm ammunition, each weighing fifteen pounds. 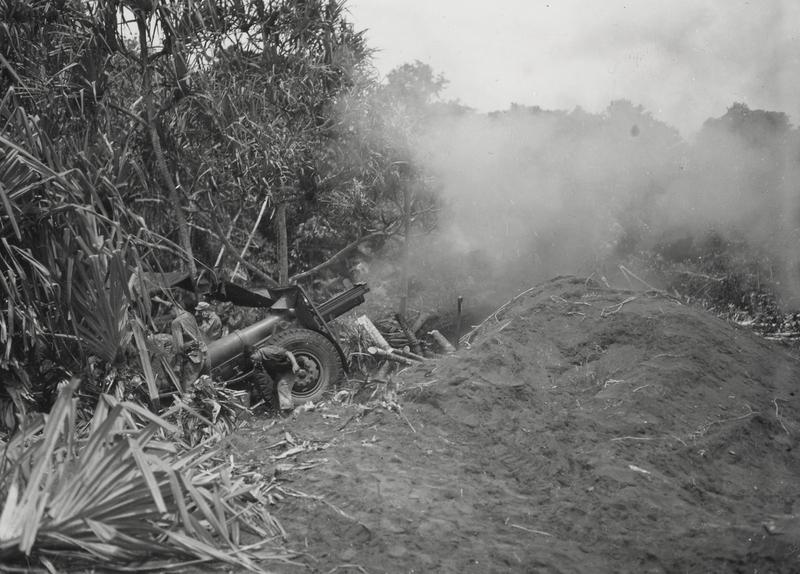 The morning of July 8, 1943 found C battery dug in on a hillside about six thousand yards from a major Japanese defensive position that the 162 called “The Pimple.” The Pimple was a thousand foot tall hill overlooking the Bitoi Track and River. To get to Salamaua, the Pimple had to be taken. The Aussies had attacked it three times. The Japanese, hunkered down in 25 pillboxes and 50 heavy weapon emplacements, threw back every assault and even cut off one of the Aussie companies for three days. On the 8th, the Aussies and the 162 tried again. This time, the 218th was there to support them. It was a big moment for the Oregonians and Washingtonians of the unit. They’d never fired their 75’s in anger before, and before the pre-assault barrage began, the men gathered to sign their names on the first shell. For days, the infantry had been charging up the Pimple into interlocking fields of fire with nothing more than grenades and light machine guns to support them. They had no tanks. Close Air Support was in its infancy and unavailable. The Japanese fought to the death. They hadn’t given ground. That changed with the 218th’s arrival. That day, July 8, 1943, the men of C Battery fired the unit’s first shell of World War II. In the ensuing days, the battery burned through its ammo supply. Men had to retrace their path back to the beach to hand carry another hundred shells. Others were air dropped, but most were damaged in the attempt. 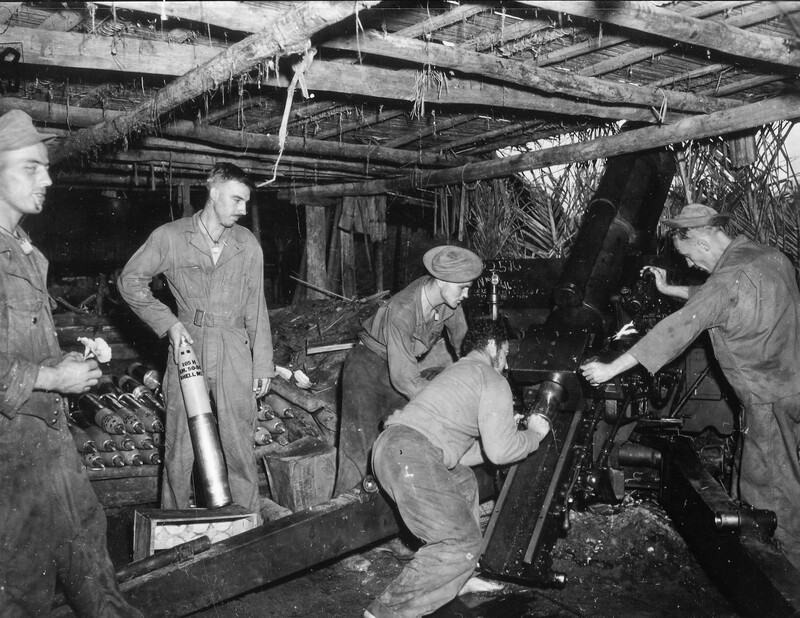 The NCO’s organized a party to recover those damaged shells, pull the primers and projectiles out of dented casings then refitted them into empties laying around the firing pits. For almost a week, the 218th hammered the Pimple, taking out machine gun nests, mortar tubes and pillboxes. Three days into the battle, C Battery received an urgent call for support. An Aussie platoon had discovered an entire Japanese infantry company coming to reinforce the Pimple. They’d gathered for a short rest during their march in an open field—no more perfect a target for the 75’s. C Battery fired nine shells per gun in thirty-six seconds and smothered that Japanese company in high explosives. At least fifty were killed and countless others wounded. The Pimple would not be reinforced. The Aussies took the hill the next day. For the next month, the 218th sent shells down range as the infantry assaulted one damn ridge after another. On the 4th of August, the unit suffered its first combat fatalities when an Aussie mortar round fell short and landed on a forward observer team, killing five men. On September 1st, with the Allied infantry at the threshold of Salamaua, The Japanese launched a furious counterattack. Dawn Company, 15th Brigade, Australian Army was cut off atop a steep ridge. Low on ammunition, the Japanese counter-assault swept toward them. Captain Burelbach, the 218th’s fire support officer attached to the Aussies, called for fire. Every gun in the 218th and 205th rained shells down on the Japanese attackers, breaking up two onslaughts and saving Dawn Company. The ordeal did not end on the 1st. The next morning, freshly landed Japanese Marines—elite troops—stormed Dawn Company’s positions along the ridge. Exhausted, weakened by jungle diseases and weeks of fighting in horrific conditions, the Aussies could not possibly hold out for long. Burelbach called for fire. The 218th ringed Dawn Company with a curtain of steel and stopped the Japanese Marines in their tracks. Later that day, Dawn Company’s commander, Captain Provan, limped into Smith Battery, 218th’s perimeter. Wounded, filthy and emaciated, he wanted only to thank the Americans who had saved the lives of his men. Without their 75’s, he told them, Dawn company would have been annihilated. The 218th’s first campaign of World War II ended a few days later. It set the tone for what followed for two more years of fierce, jungle fighting in long forgotten places that served as stepping stones to the Philippines. Unheralded, these campaigns unfolded against a brutal and determined enemy that asked no quarter and gave none. The 218th played a significant role in MacArthur’s drive to Leyte which cut off 250,000 men—as many as were surrounded at Stalingrad in 1943. Of those 250,000, less than 11,000 were left to surrender at the end of the Pacific War. The 41st and the 218th took part in one of the greatest and most successful military operations in American history—and received almost no notice for it. That is the hallmark that characterizes the artillery, unfortunately. Overshadowed by the infantry, by special forces, the whiz-bangs of the Air Force’s smart weapons, the artillery has been virtually ignored by the American media, except to demonize it over collateral damage. The truth is, those who matter know its importance. 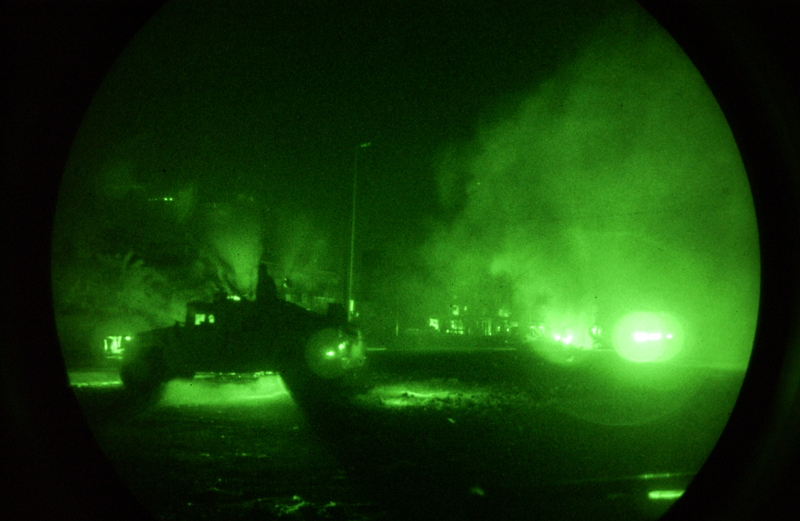 They know that the U.S. Army’s success on every battlefield from Boston Harbor in 1776 to the most furious onslaughts in Afghanistan and Iraq are built on the backs of the men and women who crew the guns. The superiority of American artillery tipped the odds in 1848, stopped Pickett’s Charge at Gettysburg, blasted the holes in the German defenses in the Meuse Argonne that the infantry exploited. The 75’s, 105’s and 155’s of World War II were the main casualty producers—something like 85% of the German losses on the Western Front came from indirect fire. Time on Target, the ability to shoot and scoot, the speed at which the artillerists could get shells downrange—those assets saved countless Allied lives and broke up countless Axis counter-attacks. Without the artillery in Korea, the mass Chinese human wave attacks would have destroyed the U.N. and the American 8th Army in 1950. Without the artillery emplaced on Vietnam fire bases, how many would have been overrun by the NVA? And the Gulf War? While the technology got all the attention, the real work was done by the artillery. The Global War on Terror changed everything. The concern for collateral damage and the cost of paying for every broken doorknob in Iraq and Afghanistan led the artillery away from its traditional role as the King of the Battlefield. Firepower, accuracy and speed were replaced with convoy security, military police duties, infantillery patrols. 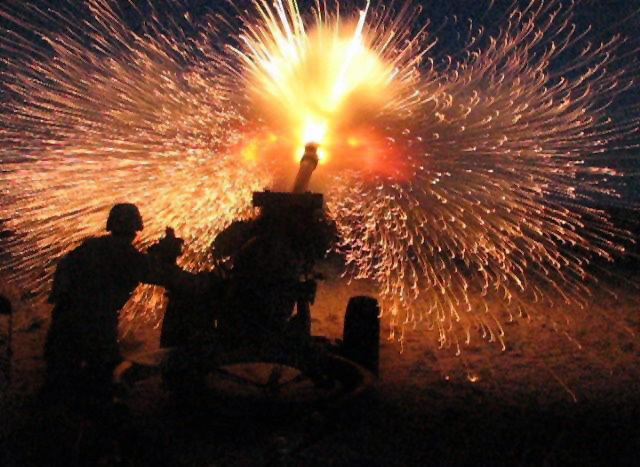 The Artillery, the most specialized and technical branch of the Army, became a jack of all trades, doing whatever needed to be done to support the mission. Yet the need for infantry support, firepower and the protection of American lives with that deadly steel curtain remained. The skills and weaponry that made the U.S. Army an unbeatable force for two hundred years have atrophied across Big Army and the Guard alike, but the threats of conventional warfare remain. Russia and the Ukraine, the demented regime in North Korea, Chinese expansion in Southeast Asia—these are threats our infantry and aviators cannot alone deter. The men and women of the 2-218th have proven their skills in this traditional role are the best in the nation. Despite deployment after deployment in non-artillery roles, the infantry you will support on future battlefields will rest a little easier knowing that the Oregon Guard has their back. Your commitment to your training has ensured these crucial skills have not atrophied. The men and women of 2-218th have proven this by winning the coveted Hamilton Award in 2012. You accomplished this despite the many competing demands you have faced since 9-11. 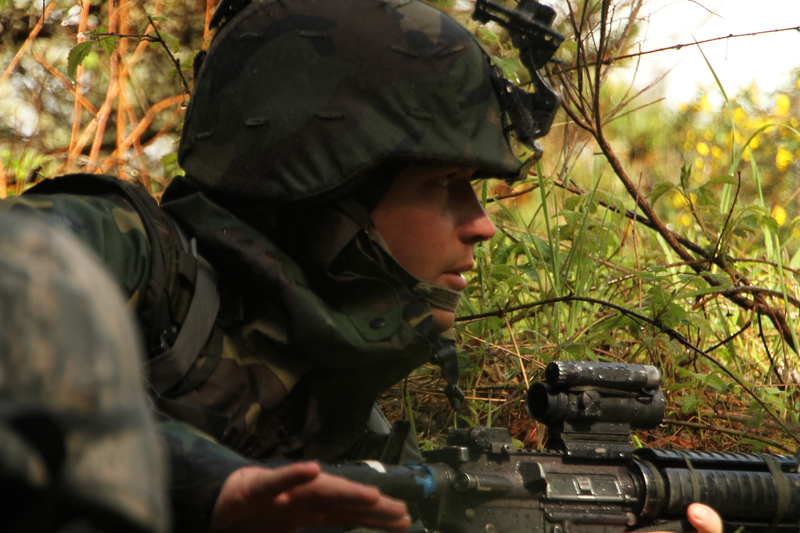 Men and women from this unit have served on every battlefield since 2004. They have been in ambushes, kinetic small arms fire engagements. They’ve called for fire at critical moments in key battles. No finer example of this can be found than Patrick Eldred, Bravo Company, 2-162’s Fist of God. 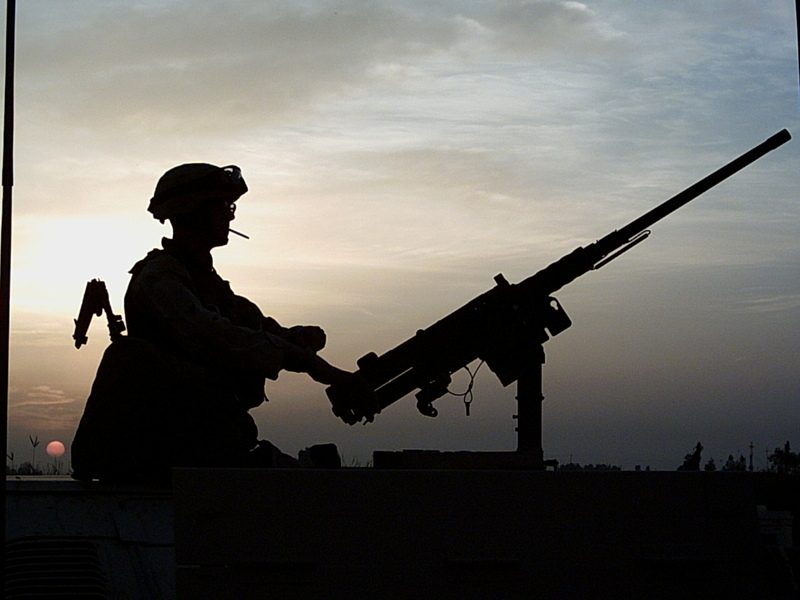 While serving as a forward observer during the Battle of Najaf in 2004, Pat brilliantly called for both artillery and air support, sometimes danger close to 2nd Platoon Bravo during sixteen days of house-to-house fighting. Pat’s precision and coolness under continuous, sustained fire for those two weeks played a decisive role in defeating the Mahdi Army fighting around the Imam Ali Shrine. Personal examples of bravery abound. Luke Wilson, a 2-218th veteran who volunteered to go out with 2-162 during OIF II is an exemplary case of selfless devotion to his Brother warriors. On the first night the battalion drove into Baghdad from Kuwait, sixty plus Syrian volunteer insurgents hit the Oregon convoy. Luke’s plywood walled 998 Humvee took an RPG that wounded everyone in back. Luke’s leg was blown off below the knee. Instead of calling for help, he continued to fire at the enemy until their rig cleared the kill zone. Even after, he refused to call attention to himself until everyone else was treated. He almost bled to death before reaching the Baghdad CASH as a result. This is your heritage, your legacy. From its first inception in the 1860’s to the battles our nation fights today, the men and women of the 218th serve with great distinction and honor. More than any other National Guard unit I’ve encountered, 2-218th is also a family. Generations serve here. It is a rite of passage for many families to serve in this unit. It becomes the core of their lives. While America has endured crises and convulsions here at home and abroad for over a century and a half, the 2-218th has been a constant. Here, service is valued. A commitment to something greater than self is at the core of that service. It is not a unit you join for financial benefits—there are no tier one bonuses to be had. This is a family you must seek out, you must want to join and be a part of this extraordinary heritage. You must want to build on that with your own actions. They say our grandparents were the Greatest Generation. They won a war with the full support of a nation mobilized in every aspect for it. They won that war with a draftee military, on broad shoulders of patriots young and old. This generation has been asked to do far more with far less. You are volunteers in the longest war in American history, a war being fought by a tiny warrior class while the rest of the nation is busy with their own self-involvements. On your capable shoulders is the flag of our nation, and members of this unit have worn it in the most remote corners of the globe. You are doing it without the full support of our political leadership or our fellow Americans. You are doing it in anonymity, without rewards beyond the fulfillment of knowing what you do has tremendous value. American artillery exists to save American lives. Without you, without your pride and professionalism, there would be far more empty seats at holiday tables across the country this year. That is what a century and a half service means. In the many trials ahead that we face overseas, the men and women of 2-218th will meet those challenges with steadfast resolve, courage and the commitment that has long since made the Oregon National Guard and its values the bedrock of our state. Our grandparents may have been the Greatest Generation. But in my book, you are the Most Noble one. If we are to save our nation in this time of great crises, it will be those like you who will get the job done. Those of us who still believe ours is the greatest nation and humanity’s last hope, vest in you our complete trust and support. On this most sacred of American holiday seasons, pull your loved ones close. With family, we will persevere. God bless you, and God Bless America.